Glamorous and sophisticated, Mary’s signature style has been the focus of over a dozen cover stories including Town and Country, House and Garden, House Beautiful, Veranda, Elle Décor, Instyle and Domino Magazine. 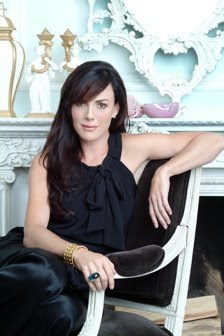 She has consistently been recognized as one of House Beautiful top 100 designers and her award winning designs have graced the cover of every major national design magazine. Her work has placed her among the elite group of America’s top designers. Mary was raised in Brentwood, attended Boston University and Parsons School of Design. In her early twenties she began her career as a milliner with her designs featured in Vogue, Bazaar, Vanity Fair and the New York Times. Mary’s sense of “couture chic” translates into a design style that is a totally fresh “New Look”. Her signature rooms are classic and clean. Combining European antiques with contemporary lines Mary creates the feeling of “old world glamour” in a contemporary world. The scope of McDonalds work ranges from commercial to residential, with a high profile clientele including celebrities and CEOs. Mary is currently working on her first book (Rizzoli) due out in 2010, while also developing a furniture and fabric line.